After the strong rally which saw gold put on USD $100oz in Q4 2018, the precious metal market has undergone a much needed consolidation over the last fortnight, with gold trading in a range between USD $1280oz and USD $1300oz. A strong rally in risk assets to start calendar year 2019 has helped temper the move higher in precious metals, and indeed we wouldn’t be surprised to see gold pull back toward USD $1260oz levels short term. 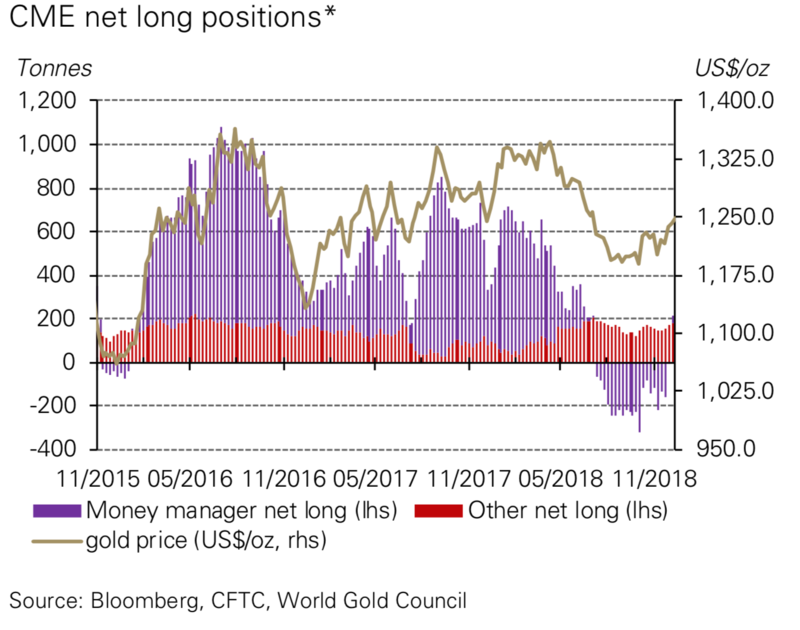 Interestingly, as we pointed out in our update from a week ago, despite the tailwinds pushing gold higher over the last quarter, positioning in futures markets is at levels typically seen at major bottoms in the gold price. This was something the World Gold Council (WGC) referred too in their recently released 2019 outlook for gold, which included the following chart. 2001 was the beginning of the secular bull market in gold that saw the yellow metal rise less than USD $300oz to over USD $1800oz by 2011. It’s not just the futures market which offers positive signs for precious metal bulls. Central banks have stepped up their buying, having accumulated over 450 tonnes in the year to November 2018, whilst China added to their holdings in December. ETF flows into gold backed products for 2018 also ended the year positively, after huge outflows from North American products in Q2 and Q3 were reversed. That’s positive, as it shows there is renewed demand for the yellow metal from this corner of the market, but it’s a long way short of the rapid accumulation of gold ETF holdings one typically sees when investors go ALL IN on gold. As a reference – at the start of 2009, investors bought over 450 tonnes of gold via ETFs in a 3 month period, whilst in the lead up to Brexit, the number was over 350 tonnes. In the 3 months to end 2018, the inflow was just 112 tonnes, a third to a quarter of what we’ve seen in periods of real froth in the gold market. The title of this wire is ‘This is what gold looked like in 2001’, a clear reference to the current speculative positioning in futures markets. 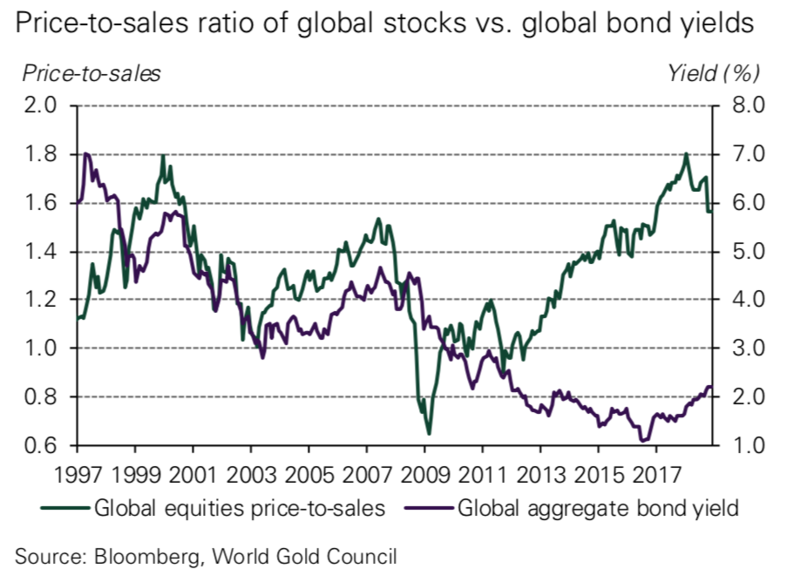 The troubling reality investors must face is that it’s not only the gold market that looks like it did at the turn of the century, but risk assets as a whole, with the following chart, also courtesy of the WGC, showing the price to sales ratio of global stocks over the last 20 years. Note that it also shows a global aggregate bond yield, which we’ll touch on later in this wire. As you can see, after peaking at about 1.8 in 2000, the price to sales ratio of global stocks sold off, as the NASDAQ crash and pullback in global equity market played out. The ratio bottomed around 2003 before rising toward 1.6 before the GFC hit, sending it down toward 0.6 in 2009, right around the time central banks fired up their printing presses. By 2018, the global price to sales ratio had hit 1.8, as equity prices roared higher on hopes we were entering a period of stronger global growth with central banks, led by the Federal Reserve, looking like they may indeed be able to successfully walk back their excessive stimulus programs without upsetting financial markets. 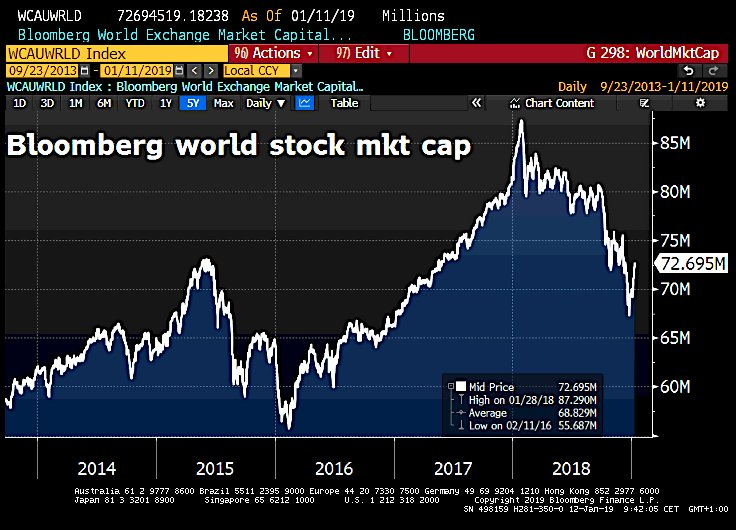 It’s too early to write the history book, but instead of MISSION ACCOMPLISHED, the rear view mirror is now suggesting instead that the early 2018 surge was instead just a blow off top in global equity markets (see chart below). As a quick aside, for those Livewire readers who think there has been no inflation in the last 10 years, consider that globally, you now have to pay 3 times more for a dollar of listed company sales relative to what you did in 2009, which works out an annualised inflation rate in excess of 10%. The clear message from this is that despite the pullback in risk assets we saw in Q4 2018, markets are incredibly stretched by historical standards. Given real cash rates are still below zero (and likely to fall) in most of the developed world, and global bond yields return less than half of what they did prior to the onset of the GFC, there is no easy solution for investors. As a liquid asset with no credit risk, and a history of outperformance in low real rate environments and periods of financial market stress, gold stands to benefit as investors position their portfolios to protect against the many threats they will face in the coming years.